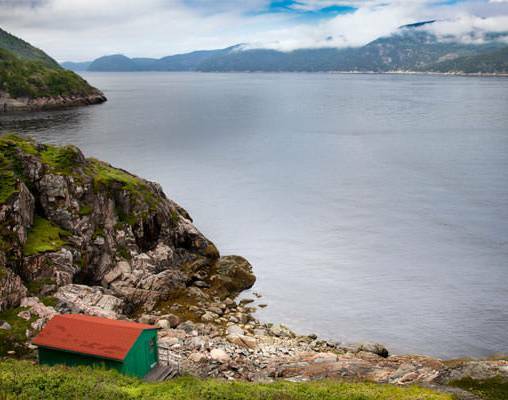 Embark on a cross-country Canadian excursion from Vancouver to Montreal with a scenic journey through the country's interior. 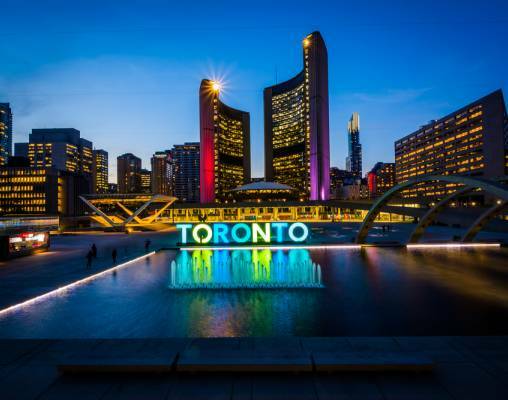 Two of Canada's most popular cities combine with an exciting train journey across the country to create one fantastic vacation. Enjoy all the pleasures of train travel as the Canadian takes you from Vancouver through an ever-changing landscape east to Montreal. You'll have amazing views of vast prairies, calm lakes, and snow-capped mountains. Kick off your adventure with two nights in Vancouver; you'll have time to explore the city and visit the Lookout Tower. 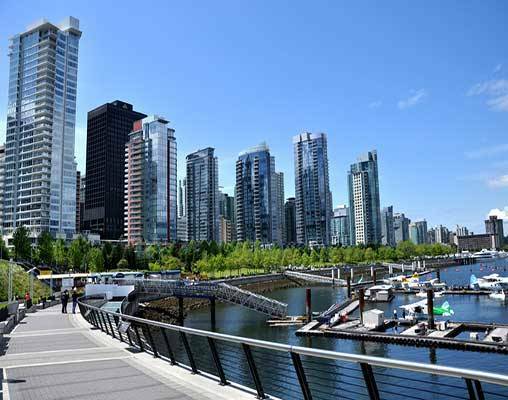 Vancouver offers a variety of parks, museums, and amazing dining. Next, travel by train to Toronto aboard VIA Rail’s Canadian. You'll pass through Jasper National Park, full of beautiful wilderness and wildlife; the majestic Canadian Rockies; Edmonton; Saskatoon; and Winnipeg. Next you’ll arrive in Toronto, which has an eclectic mix of city skyscrapers and relaxing green spaces. Experience the beauty of Niagara Falls on a full-day sightseeing trip. Then board VIA Rail and begin your journey east through Quebec. Once you arrive in Montreal, take a guided tour of this bustling city. You also have free time to explore the city's art scene, wander the cobbled streets, or indulge in French cuisine to top off this ten-day adventure. This itinerary is also available from Montreal to Vancouver based on your travel preference. Arrive in Vancouver, check into your hotel and spend the remainder of the day exploring this scenic city on your own. Included is admission to the Vancouver Lookout, offering panoramic views of the city. Your centrally-located hotel puts you steps away from many of the city's attractions, shops and restaurants. Overnight Vancouver. Spend the morning at your leisure, enjoying Toronto as you like it. Depart on a mid-day train to Montreal on VIA Rail's Corridor Service. Get acquainted with the city on your own this evening. Overnight Montreal. Enjoy a tour of Montreal as your guide introduces you to the highlights of this diverse city that's full of history. Your motorcoach will stop at selected sites where you can grab pictures and explore further. 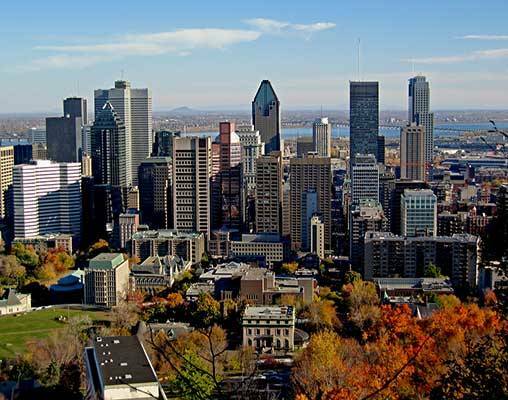 Discover Old Montreal, the Olympic Stadium, Mount Royal Park Lookout and Saint Joseph's Oratory. Overnight Montreal. Your Canada rail vacation comes to an end this morning. You may want to extend your stay in Montreal to fully explore the city and all of its incredible sights. Or, head to the airport on your own with memories to last a lifetime. Hotels include the Delta Hotel Vancouver Downtown, Chelsea Hotel, and Delta Montreal. VIA Rail accommodations on the Canadian are in Sleeper Plus Class in a semi-private berth. 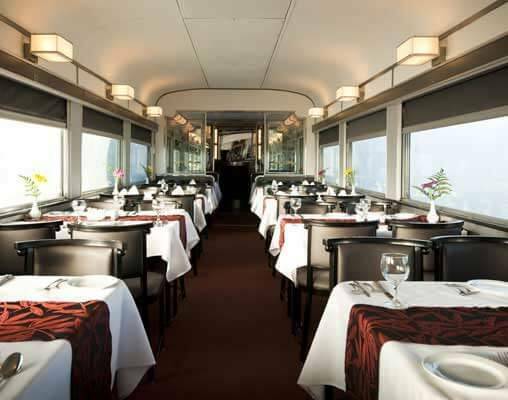 Meals are included onboard the train along with access to lounges. VIA Rail accommodations on the Corridor Service are in Economy Class and include a seat with picture window. Light meals, snacks, and beverages are available for purchase . Hotels include the Sheraton Vancouver Wall Centre Hotel, the Sheraton Centre Toronto, and Marriott Chateau Champlain. VIA Rail accommodations on the Canadian are in Sleeper Plus Class in a private cabin. Meals are included onboard the train along with access to lounges. VIA Rail accommodations on the Corridor Service are in Business Class and include a seat with picture window, access to the in-station Panorama Lounge, priority boarding, and a delicious meal including wine. Hotels include The Fairmont Waterfront, The Fairmont Royal York, and The Fairmont Queen Elizabeth. VIA Rail accommodations on the Canadian are in Sleeper Plus Class in a private cabin. Meals are included onboard the train along with access to lounges. VIA Rail accommodations on the Corridor Service are in Business Class and include a seat with picture window, access to the in-station Panorama Lounge, priority boarding, and a delicious meal including wine. Hotels include The Fairmont Waterfront, The Fairmont Royal York, and Fairmont the Queen Elizabeth with accommodations in upgraded rooms. Onboard VIA Rail’s Canadian, each Prestige Cabin has a modular leather L-shaped couch by day and a Murphy bed for two by night facing the window with electric radiant heated cabin floors and walls that maintain a comfortable and constant temperature. Highlights of Prestige Class include: personalized dedicated service by a Prestige Concierge; a spacious cabin, large windows and a private washroom with shower; flat-screen TV with video selection; complimentary minibar stocked with a selection of beverages; exclusive access to the Park Car (select hours) with its lounges and 360-degree panoramic views and more. 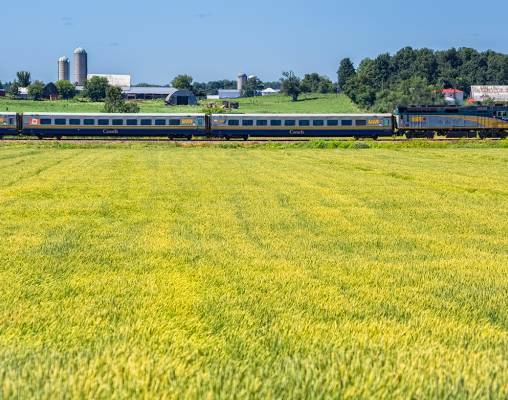 Accommodations on VIA Rail’s Corridor Service are in Business Class and include a seat with picture window, access to the in-station Panorama Lounge, priority boarding, and a delicious meal including wine. Additional departure dates available, please speak with a rail specialist for details. Click here to view testimonials for Vancouver to Montreal Trans Canada Adventure. Exceeded my expectations and had a memorial time. Loved the tours and hotel suggestions. $2,553 Please call for availability. $2,610 Please call for availability. $3,402 Please call for availability. $3,338 Please call for availability. $4,178 Please call for availability. $4,240 Please call for availability. $6,788 Please call for availability. $6,849 Please call for availability. Enter your details below if you would like to be notified when 2021 dates and prices are available for Vancouver to Montreal Trans Canada Adventure. Prices are correct at the time of publication, however are subject to change at time of booking. Hotel and Rail accommodations listed above, are subject to change based on availability at the time of booking. Prices are land only, per person, based on double occupancy. Taxes are not included on rail portions and are subject to change. Vancouver Trolley Attraction Tour & Lookout Tower will not be available December 25. Sightseeing Tour of Niagara Falls will not be available December 25, 26 and January 1. *Select Thursday Departures in December, as well as Mondays January - March will not include the Heart of Montreal Motorcoach Tour.